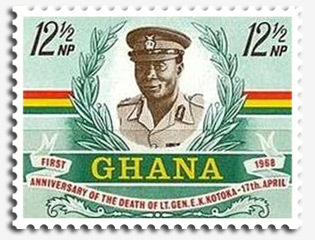 Accra Kotoka International Airport was named in honor of Lieutenant-General Emmanuel Kwasi Kotoka (1926-1967), a member of the National Liberation Council who was killed in a coup attempt at the place where today is the forecourt of the airport. 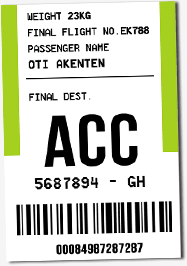 Accra Kotoka International Airport is the largest airport in Ghana. Its international code (IATA code) is ACC. Its ICAO code is DGAA. The Accra airport area ​ covers about 300 hectares for a secure perimeter of about 10km. Its 3400-meter runway allows the landing of the largest aircraft such as the Boeing 747. Terminal 1 used to serve mainly domestic and regional destinations, it was closed on October 8, 2018 as domestic airline operations have moved from Terminal 1 to Terminal 2. Terminal 2 was used for international destinations and long-haul flights. It is equipped in shops and services (VIP lounges, shops, duty free, restaurants). As the new Terminal 3 was recently inaugurated, Terminal 2 is now the new domestic terminal of Kotoka Airport. Terminal 3, inaugurated in 2018 is the new international terminal. It comprises five levels spread across an area of 48,268m². Ultramodern facilities with capacity to handle 5 million passengers a year and 1,250 passengers per hour, six boarding bridges and a large 7000m² retail area provide comfort and safety to our growing number of passengers. The official terminal is used for diplomatic flights, the reception of personalities and heads of state and government. The military terminal managed by the Ghana Air Force is dedicated to the air operations of the various army corps. The management of arrivals and departures of travelers makes Kotoka Airport a pleasant and modern airport and an ideal gateway for foreigners to discover Ghana or for Ghanaians to go abroad. Its services and facilities, its shops, its accessibility and its car parks allow passengers to wait for their flight in the best conditions. In order to facilitate your trip, we advise passengers to take all necessary measures to be in good standing with the customs and administrative requirements (passport, visa, etc. ).